I'm heading back to London tomorrow. I'm a very happy man. I'm having a very good day. So far today has been the best day of a very good week. I recorded two more pieces for The Daily Show this evening. One of the pieces will air tonight in the US and on Friday night in the UK and the other will go into another show some time in the future. I was excited to step up to the plate and record a correspondent piece for them on Monday but the pieces I did tonight are much more defined as my own so now it really feels like I'm a part of the show. The show that just happens to be one of my favourite shows in the world. The guest on tonight's show was Robin Williams. As he was shown through to the back of the set before his interview I was weighing up whether it would be uncool to introduce myself. Well, not so much whether it would be uncool because it obviously would... but how uncool and whether or not it would be worth it. I didn't. He did his interview and was then whisked away. They then taped the rest of the show and then when that was done I went on to do my second piece at the desk with Jon. You can imagine I was pretty surprised to come off set to find that Robin Williams had hung around especially so that he could say hello and pass on his kind words about my two segments. You see what I mean about a good day? 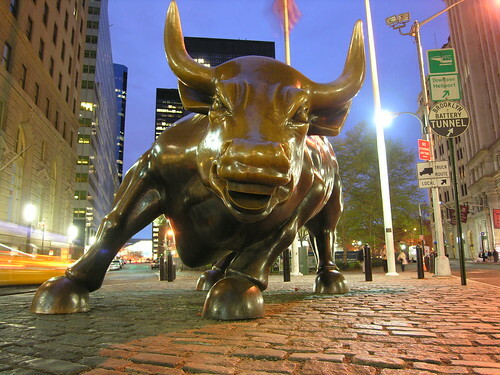 Charging Bull, originally uploaded by Dave Gorman. New York is a very exciting city. Yesterday was a very exciting day. I'm here partly to discuss a few ideas with The Daily Show which is, amongst other things, one of my favourite TV shows in the world. I was expecting to film a short piece with them that might air on Wednesday night and there was a possibility of doing a couple of other bits later in the week also. So that's what happened... and tonight I appeared as a correspondent who was supposed to be in London. Which is where I had been two days before. In the UK the show is broadcast on More4 a day later so it'll be on tonight and if the original piece I was expecting to film on Wednesday goes ahead that'll be on in the UK on Thursday. 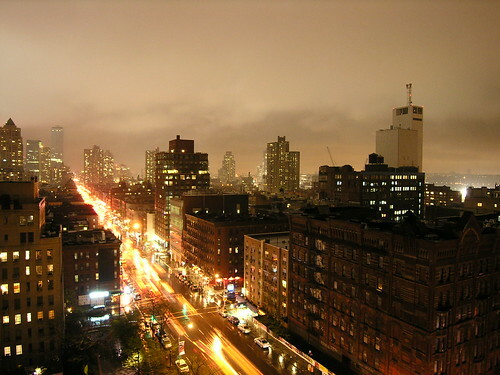 New York in the Rain, originally uploaded by Dave Gorman. I'm going to New York today. The documentary I presented about Top Of The Form was shown last night along with a few related programmes... a sort of Top Of The Form night for BBC4 with me as the host. I wrote about the filming of this in a freezing cold Neasden warehouse one day back in February. The first time I saw the footage we'd shot was a few days later when I recorded the voice over, this time in a cosy studio. I remember at the time being struck by how red my nose was in most of it... real proof that the warehouse was indeed freezing. In fact, at the time I wrote "If you watch the show when it goes out you'll notice that I have a very red nose in most of it." I was right. You did notice. Everyone seemed to notice. I got to work today (at the BBC where a band of bearded men are merrily working on the news series of Genius) and one of my colleagues instantly told me that he'd spent part of the night before staring at my red nose. Just as we started work a friend called me. His first words were, "My wife wants to know if you had a cold?" I've even heard reports hat Ken Bruce was talking about the redness of my nose on Radio 2 this morning. If Ken Bruce is talking about something on his show surely that makes it a national talking point. Imagine your nose being a national talking point. It's hard to imagine isn't it? Even for you big nose. Crikey. Total sponsorship so far: £5659.59. 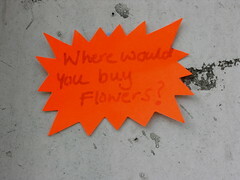 I would go to a florist, what about you?, originally uploaded by Dave Gorman. Yesterday I put a new innertube on my front wheel. My bike's front wheel that is, I have only legs. As I was doing it I realised that this was the first time I had ever performed such a task. That's odd seeing as I'm 35 and have owned a bike for most of my life. Well, several bikes; if I was still riding my first bike I'd look silly. As a kid when my bike had a puncture I would always pester my Dad into fixing it. He would always do it in an I-don't-know-why-you-don't-do-this-yourself-you're-perfectly-capable kind of way and I suppose he was right. I think I never thought I'd have to learn how to do it properly because as a kid I assumed I would no longer be riding a bike when I was an adult. And besides he's a man who likes to get oily and fiddle with machines so really I was indulging him by letting him do it. I don't think I've had a puncture (on my bike) since I was around 12. I suppose that while I've continued to cycle (albeit very infrequently for most of the last 20 years) I've been much less likely to be cycling on rough wasteground and near broken glass and things. Or maybe I've just been lucky. Anyway, I did it and this morning the tyre was still inflated so I think it was a successful operation. Now if I ever have a child I will be better equipped to fix his/her punctures in the same slightly-weary-I-shouldn't-really-oh-go-on-then fashion. I'm working from home today and struggling to concentrate (which explains why I'm writing this right now) but my spirits have been lifted by listening to the wonderful Lily Allen. It's wonderful when a new piece of music makes you feel genuinely excited. The track LDN is quite, quite brilliant. Gritty lyrics and happy summery tune. It explains why I love living in London. Hurrah. Total sponsorship so far: £5451.51. If I'd known how busy I was going to be this week I'd probably have done the sensible thing and turned down The Wright Stuff. Not because I don't enjoy it - it's always a fun week - but because I like sleep. Each day after the show I've headed into town to work on Genius and each evening I've been working at home on another writing project. I've been getting to bed at 2am and waking at 6.30. I'm knackered. A couple of night's ago when I was heading to bed in the early hours I had the TV on in the background. A show called Mint was on ITV. This is one of a new breed of evil telly that seems to be increasingly popular. The commercial stations have found it harder and harder to make money out of advertising of late - especially in the wee hours and so they've come up with programmes that pay their own way instead. They have big cash prizes on these shows and rather than quizzes they have what amounts to a guessing game. Every call makes them money even if you just get through to a recoded voice telling you that you've been unlucky. I suspect they're making a fortune. Even though the shows are evil and exploitative (for every "don't make too many calls, please set yourself a limit" there are fifty "just think... you could be thinking of the right answer... if you don't call you can't win... how will you feel if someone else gets through with your answer and wins ten thousand pounds? What could ten thousand do for you? Think about it. I could be sending you ten thousand pounds just for making a phone call... you don't want to miss out on that do you?") I have to admit to a grudging amount of respect for the presenters. The best of them have that QVC kind of ability to talk about nothing for ages while they wait for a call to come through. Incidentally, they might be waiting but it isn't because nobody is calling... they're waiting because there's presumably a system that works out when they've made enough money to start giving some away. A friend of mine tried calling one of these shows on a cable channel the other week. He called two hundred times. At 60p a call. He was very embarrassed when he told me about this. As he should be. You see what I mean by evil... but that doesn't mean that there is no skill in keeping the show afloat while there is nothing to talk about and I sometimes find myself staring in fascination at them partly wondering how they manage to keep talking and partly wondering how they sleep at night knowing that they talked hundreds of strangers who can ill-aford it to waste hundreds of pounds entering a lucky dip. Anyway... when I turned on the TV the other night I had no intention of watching it because I knew I had to be up at 6.30 in the morning but I wanted something on in the background. So, Mint was on and one of the not-very-good-presenters was talking to Mick Miller. Mick Miller is an old-school comedian from the trad circuit, but one I admire for his delivery and craft. He was the guest on the show and people were phoning in to guess comedian's names. If they guessed the right name they would win a cash prize. When I turned on the more obvious names (Steve Coogan, Peter Kay, Jimmy Carr) had been guessed winning people smaller sums of money and a few of the more obscure answers (like Jethro - euch) had been guessed winning people larger sums of money. Then someone won ten thousand pounds for guessing Dudley Moore. I suppose he was deemed obscure because he's dead. And possibly people had been steered towards currently working comics. That left one answer still to go. It was worth five thousand pounds. A few wrong guesses started coming in and they started increasing the prize money with an extra hundred quid each time. A small part of me was thinking, "Well, I know a lot of comedians... maybe I should call in... I mean, I know I won't get through because I know the story my mate told me about his 200 calls... but y'know, if I did... I might be able to think of an obscure comedian that no-one's thought of yet..." and then I snapped to my senses, turned the box off and put my head down. The next day I had an e-mail from someone telling me that I had been the correct answer. Apparently I went for 7 thousand pounds. By the sounds of it by the time they gave it away the presenters were giving huge clues, telling people all sorts of information about me and all but giving them my name. I'm amused by the idea that the Great British Public cannot guess my name when asked to think of a comedian. I think I should probably be slightly offended that I am clearly the most obscure comedian in the land... but somehow that seems more like an accolade to me. Hurrah for obscurity. Obviously, this would have been a far better story if I'd called up, guessed my own name and won 7 grand. But sometimes the not-quite-so-good-story is what happens. My Mum once won a prize on a local radio station for recognising my voice in a who's-the-mystery-voice competition. She told them she was my Mum which may be the reason they never sent her a mug. I would have told you the name of the e-mail correspondent who passed on this exciting punter-wins-7k-for-saying-my-name info but I can't right now because the e-mail is on my laptop and I'm now back to using my desktop which has returned from the computer hospital and seems to be fit and well. 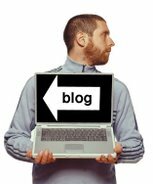 After I wrote something about my computer problems many of you got in touch to offer techy advice - all of which is very gratefully received. Ta. One more day of The Wright Stuff to go this week and then some proper sleep comes my way. Total sponsorship so far: £5135.87. I'm impressed and grateful... but somehow it seems a bit dissatisfying next to a story about someone winning £7000 for saying my name. Please do keep it coming. Someone offered to steal my camera from me today. I declined. I wrote more about it here. Why do Time Team only have three days to do their digs? Total sponsorship so far: £4588.37! Please do keep it coming. It seems the mail-out to my mailing list has worked wonders. I was letting them know about some upcoming stuff - like next week's The Wright Stuff - but also asked them to sponsor me for the London to Brighton bike ride on June 18. Many of them have done and the total raised has risen dramatically as a result. Which makes it all the more embarrassing that I am going to have to drop out of the event. Ha ha ha. Not really. It is April 1st. If you believed that I was going to drop out of the bike ride you are an April Fool. Unless you were reading this after mid-day on April 1st in which case I believe it is me who is the fool. There, I think it is traditional that everyone who writes on April 1st must contain in their writing a blatant lie to try to fool people. I like to get mine out of the way early on. This next bit will sound like a carefully constructed lie but is in fact true. I am now a 'published photographer.' Oh yes. What Digital Camera magazine (who bill themselves as The UK's original and best digital photography magazine) have a few of my shots in the April issue in what they call Best Shot Selector... Reader Gallery. The truth is, I can't honestly claim to be a reader. I mean, I do read... just not WDC. Still, I don't want to sound ungrateful because I'm not. I'm a hobbyist photographer and I was very flattered when they asked if they could run the photos and genuinely delighted to see them in print. Apparently I've won an Epson Stylus R800 printer for my trouble as well. That's nice. The Times newspaper have a feature on comedy in today's paper. They're running with an April Fool's Day/Fools theme you see. They've assembled fifty names (I'm one of them, phew) and then broken that fifty down into ten sets of five. There's a list for 'novelty acts' too. 'Novelty Act' is a term normally applied (with derision) to people who juggle fish or who can eat 35 eggs so I was slightly alarmed to see myself in that list. They provide their own definition of 'novelty act' as being anyone who doesn't fit into any other categories, presents high-concept shows and/or uses laptops on stage and obviously I accept that this has me covered. But it still seems odd. Maybe I'll start referring to myself as "one of Britain's best novelty acts" ... it would be interesting to see who would come to see such a thing. I think Bernie Clifton should be at the top of that list and he doesn't even get a mention. Total sponsorship so far: a staggering £4177.99! Keep it coming. The book describes itself as being a collection of "Observations and denunciations from a founding member of Monty Python" which means that unlike many books this one can be judged by its cover. This is a collection of essays and columns from newspapers broadly about the war on terror. It's also wonderfully funny because while there's some anger at work here it has a kind of befuddled tone to it. The thing is the situation must be hard to describe when it's so hard to believe... but with wild analogies he makes a fantastic job of it and makes something we're in danger of becoming numb to seem every bit as ridiculous as it is. I did cycle to the poker game on Wednesday. I lost money. Not a serious amount of money - less than you might spend on a night out - and then cycled home in the rain. I was happy doing this. I'm not sure why. The people who make Genius (or Team Genius as we like to call ourselves) had our first proper meet up yesterday to start work on the new series. The process starts by going through the ideas we've been sent looking to see if they spark conversation between us. There was a very hight strike rate and we didn't get anywhere near to getting through everything that has been submitted. (Feel free to send more though - we enjoy reading them) Team Genius had four beards yesterday. I am very happy sitting in a room with three other bearded men working on a Radio 4 show... I feel sure that this is life as it should be lived. I have a week of early mornings starting on Monday when I'll be a panellist on a week's worth of The Wright Stuff. I will spend my mornings talking about what's in the news and my afternoons discussing potentially genius ideas with bearded men. And my evenings thinking about opera. I'm looking forward.